What happens when an accomplished artist looks at his work after nearly seven decades and assesses his hits and flops, his favorites and his…well, his other favorites? There may be wisdom of hindsight and the good fortune to be able to hand-pick the highlights. There is a dose of ego, sometimes heaping. Most importantly, there is something deeply personal about this kind of reflection. I’m, of course, talking about the artist Harold Prince and his Harold Prince Party™, Prince of Broadway, which uses its unashamed navel-gazing to chart the history of the modern musical. Prince’s career is a viable choice for a musical revue: he has directed and/or produced many of the seminal pieces of musical theatre in the past seventy years and has won a record-breaking 21 Tony Awards. With so much material ripe for the choosing, it is a Herculean task selecting what to present in this revue, and how to structure the form for the songs to flow from one to the next. Prince of Broadway does not adequately accomplish this task. The nine-actor ensemble delivers interstitial dialogue between musical numbers as if they are each Harold Prince. The dialogue, by David Thompson, is often extremely brief anecdotes including how Prince met Stephen Sondheim (someone introduced them and they decided to work together – that’s the whole story) or how he didn’t agree with reviews (no way!) or how his career is based on luck (an opportunity to work for free in George Abbott’s office). This conceit is almost immediately tiresome. The book is cultivated from interviews with Prince, but whittled down to brief sentences that end up being only cutesy and do not afford the actors any opportunity for engaging storytelling. Their only option is to play them as punchlines without a build-up. The show begins with a chronological timeline charting the early stages of Prince’s producing, which is the most obvious way of telling a biographical story. Yet, this section has a nice connect-the-dots flow—producing fell into Prince’s lap and the growth of his stature in the theatre community is built smoothly through musical example. However, three quarters of the way through the first act, the chronology is abandoned when, after three songs from 1973’s A Little Night Music, we are suddenly, without explanation, thrown back nine years to 1964’s Fiddler on the Roof. The former seamlessness is not reclaimed. The second act’s structure hops around in time and disjointedly attempts to link songs by theme. Michael Xavier (as Prince) says, “I rarely direct revivals…” except for that time he directed a revival! Cue Show Boat. Janet Dacal (as Prince) says, “I’ve done two musicals set in prisons.” Cue Parade and Kiss of the Spider Woman. The entire evening climaxes in three songs from Prince’s commercial juggernaut The Phantom of the Opera, still running in its 29th year. Compared to the many musical selections presented immediately before it, Phantom pales. It is not a great work of art. It’s also not Prince’s favorite work from his career—which we learned earlier in the evening was Follies. It is not clear why the entire evening leads us here, or why we should think of Phantom as the pinnacle of Prince’s career. 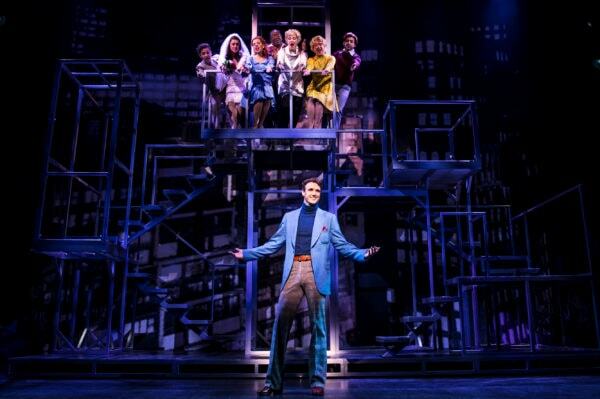 The unexpected twist of Prince of Broadway is that it somewhat inadvertently, celebrates the talents of Tony Yazbeck alongside Harold Prince. More than any of the other eight performers on the stage, Yazbeck melts into the roles he is allotted as if he is not only playing them in snippets devoid of context, but in the entire show. Yazbeck is the truest triple threat currently working in the American musical theatre; he sings, acts, and dances with a facility that is unmatched. He burns with teenage angst as Tony in the West Side Story sequence. He fiercely taps and sings his way through “The Right Girl” from Follies. His glorious tenor is let loose on “This is Not Over Yet” from Parade. It may be that Yazbeck excels in this type of material because his entire persona is of another era; he is a song and dance man forged of qualities rarely seen in contemporary musical theatre actors. There are other performance highlights. Karen Ziemba’s “So What?” from Cabaret, allows her to channel the Sprechgesang style of Lotte Lenya (who originated the role) and the song is performed with a warm sternness. Emily Skinner’s “The Ladies Who Lunch” from Company, is imbued with a sardonic bite in every note. Chuck Cooper and Bryonha Marie Parham perform two songs from Show Boat. Cooper’s “Ol’ Man River” is richly shaded and aches with a timely pang. Parham’s ebullient “Can’t Help Lovin’ Dat Man” is a delight. The arrangements and orchestrations by Jason Robert Brown unite the various composers’ musical voices into a welcome coherency. Beowulf Boritt’s scenic design finds continually surprising ways to transform the empty stage set into the many locations depicted in the represented shows. William Ivey Long’s costumes and Paul Huntley’s wigs nod to the work of each production’s original designers, but are tweaked with their own signature stamps. Susan Stroman and Harold Prince share co-directing credit but, for the most part, the staging is unremarkable. Actors are mostly stationary, except when they are dancing Stroman’s characteristically thrilling choreography. The goal of Prince of Broadway is unclear. On one level, we are meant to see it as a fête honoring Prince’s storied career, and it checks all the boxes. But what complicates this is Prince’s personal involvement with the project. He is deeply entrenched in its creation as its director. Viewing it in this regard, it is closer to a staged memoir than an honorific gala. This pull between a third-person round of applause and first-person reflection keeps the show from ever really finding its feet. The result is a string of songs – some performed exceptionally well, some not so much – that plod along without any perspective.